How a leap of faith saved a pig…and nine more lives. For one pig, jumping from a flatbed truck traveling down the highway would be the best decision of her life. Drivers on Highway 50 near downtown Sacramento reported seeing the pig break free of her flimsy metal cage, leaping from the moving vehicle. Amazingly, the pig landed on grass and was left unharmed by the fall. Animal control officers wrangled the petrified pig and transported her to the dog and cat shelter. We wanted to save the pig, but by law the shelter had to give the “owner” time to reclaim her. And then came more news – as if leaping from a moving truck wasn’t stressful enough for this pig, she gave birth to 14 piglets! No wonder she was trying to escape! 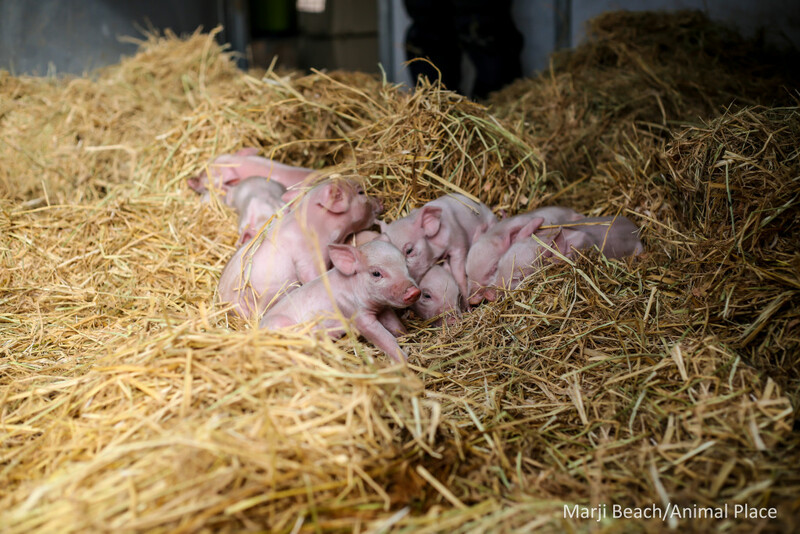 Five piglets did not survive, but nine did…and the whole family needed safe haven fast! By this point, the pig and her brood remained unclaimed by any “owner” and we were free to rescue all ten pigs. Now it was our turn to take a leap of faith. We had already taken in several other animals and had limited space, but we knew we needed to help this pig (now named Rita) and her babies. We rushed to the shelter. Rita and her piglets were loaded up into our trailer (the piglets safely in a crate where mama could see them) and brought them back to our Grass Valley sanctuary. It took a few days for Rita to become comfortable with humans around her babies, but she is warming up to her caregivers…especially when we bring her grapes and cantaloupe! The piglets are thriving under Rita’s gentle care. They enjoy special heat lamps at night and frolicking outside with mama during the day. Watching them grow, enjoy life — all under the watchful eye of their mom – is heartwarming. It is unbelievable anyone could look at Rita or her babies and see “bacon” or “pork” instead of intelligent and sensitize individuals. Right now, Rita is eating around 5 pounds of feed a day! And soon, the piglets will all need to be spayed and neutered as well as vaccinated and de-wormed. Your donation towards their care will help Rita and her piglets thrive! We spay and neuter all of our rescued pigs for a few reasons. One, to prevent breeding and accidental litters. As cute as piglets are, we would be unable to save more lives if we allowed breeding to occur. Two, spaying female pigs greatly reduces the risk of mammary cancer and uterine infections, common in intact pigs. And three, spaying and neutering reduces potentially aggressive behavior toward both other pigs and humans. Help with Rita and her piglet’s care by donating today! Donate any amount to help care for Rita and her quickly growing piglets! A $15 donation will feed four of Rita’s piglets for one day! A $35 gift covers the costs of spaying and neutering all the piglets and Rita! This is so very heartwarming!! Animal Place is so wonderful and caring and I am so proud to be able to help them as they save animals and nurture them and promote humane and loving treatment of all animals. Thank you Animal Place and God bless you always. I agree with you. This is awesome story . Made me be so happy for mama Rita and her piglets ? ? ? ? ? ? ? ? ? ? are free and safe place but I am very sad ? ? for other animals suffer to a terrible factory farm ..Coworker were very mean and abuse animals they are so screaming…I am so upset at farmer or people took newborn calfs away from their mother cow to slaughtery.. I can’t imagine that how they feel. I don’t want think about it anymore. It’s too painful for me..
smart Mom and adorable babies pigs. God Bless your Heart ! What a brave, smart mother! I’m so glad Mom and most of the babies survived and will find a good home. Thank you! How horrible it would have been for Rita if she’d had to give birth at the slaughter hiuse. Finally, a happy story! People do not realize how intelligent pigs are. This mama new her only chance to live was to get off the transport truck. God bless her and her new babies!!! Thank you to the good Samaritan who helped give her and her family a safe, happy life! GLORIOUS to watch such a happy result!! A snail mail cheque will come shortly! As a shelter volunteer, I’m well acquainted with Rita. Lovely girl. She LOVED the organic green grapes I gave her. A much- deserved happy ending for Rita. Your wonderful story made my day! I can not donate but I am very happy to know she is fine and all the babies. I can not donate but I am very happy to know she is fine and her babies. We need to help ours animals! such a cute video and I’m ALL for going vegan. These babies are way too cute. Thank you for sharing this beautiful video!! ? Are you looking for homes for the piggies when able to leave Mama? Check their Facebook page. They do amazing things for animals all the time. And running a farm sanctuary is expensive and often donations keep them running. They are 100% real. I wish I could do what they do. Thank you so much for taking in Rita and her babies.. Thank you again for your kindness and love of animals.. I saw this story on Facebook and I was SO sad that somebody would think to slaughter a pregnant pig. This pig is AMAZING for jumping off of the truck. Glad she was okay and that most of her babies survived. I would like to donate to her. I can’t right now, but I’d like to at some point and I’d like to make sure it goes to her whatever I can send. Most people don’t realize that pigs are very intelligent. If taken out of how they are raised at “factory farms” their intelligence is about that of a 2 to 3 year old child! I rescued a little pot belly pig years ago and was amazed at how smart she was! With NO training, she would go to the door and snort to be let out to do her business. She played with my cats and loved to be petted. When she wanted to eat (too often) she wuld pick up her dish and bring it to you. Her only fault was that she liked to push up the grass and leave bare spots. We found her a good home in a pig santuary as our town does not allow a pig to be a pet. Have a Pig sharing my life,yard, car, money, home, treats,adventures and the bed with me and my Bulldog. So much joy and fun. Rita and her Babies will do the same for any person lucky enough to be in their lives. Bless everyone at Animal Place and all the wonderful Beasties too. I love pigs. Who wouldn’t. Bacon lovers? Think of eating those darling piglets! Makes you want to burst into tears. I think nthrse pigs are loving and smart and should never. Be killed for humans to eat at bacon nor hot dogs. I love pigs so much. Thanks that they live in a sanctuary. A very lovely and touching story. But, something sticks in my mind after visiting a number of sites, including this one. Just how does anyone know where the truck transporting Rita was headed? Apparently the truck didn’t stop nor anyone come forward, and I don’t believe anyone followed the truck. But dang, a personified, pregnant pig leaping from a slaughterhouse truck, to save her unborn piglets makes for a heart tugging, potentially donation generating story. We don’t state that we know where Rita was headed (we did not tell news outlets that, either). We can make some deductions…it probably wasn’t anywhere good. We do know she was terrified and that she jumped from a moving truck on the highway. And she saved her life and that of her piglets. It’s a little baffling anyone would see anything but that. All the feels! I am sorry to hear of the piglets that didn’t survive but I am so happy for the others and for the Mama too! Thank you!